L.A.-Based Producer to Host Clinic on Recording Invention: PEDALpUNK! Funneling water from a fire hose into a garden hose to put out a blaze doesn’t make much sense, and the same is true for running rich, low-fidelity sounds through a high-tech professional audio recording system. 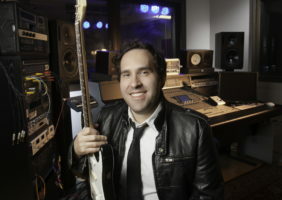 Producer and entrepreneur Scott Eric Olivier, who has worked with a wide range of artists, from Michael Jackson, Gwen Stefani and Van Halen to Christina Aguilera, Chris Cornell and the Goo Goo Dolls, recently unveiled his invention named PEDALpUNK!. PEDALpUNK! is an adapter that acts as a conduit between analog devices (virtually any guitar effects pedal) and computers without compromising sound quality. Olivier, a native of Louisiana, is an ideal blend of roadie, engineer, producer, and IT nerd. He built a computer when he was eight and picked up the drums at the age of 10. As a teenager, Olivier spent time in New Orleans, where he worked as a musician and recording engineer. He eventually made his way to Los Angeles, where, working as an engineer on more than 200 albums, he created several tech-based music inventions, including Laptop Roadie, a secure cloud storage vault. Olivier will host a clinic on PEDALpUNK! in Hollywood, where he will donate one PEDALpUNK! to the College of Contemporary Music, while a second one will be given to one lucky attendee via a random drawing at the end of the clinic. Olivier will host a clinic on PEDALpUNK!, Friday, April 22, at 1 p.m. in the Concert Hall at the Musician’s Institute located at 6752 Hollywood Blvd, Los Angeles.